Are you looking for things to get rid of today so you can clear out some space in your home? 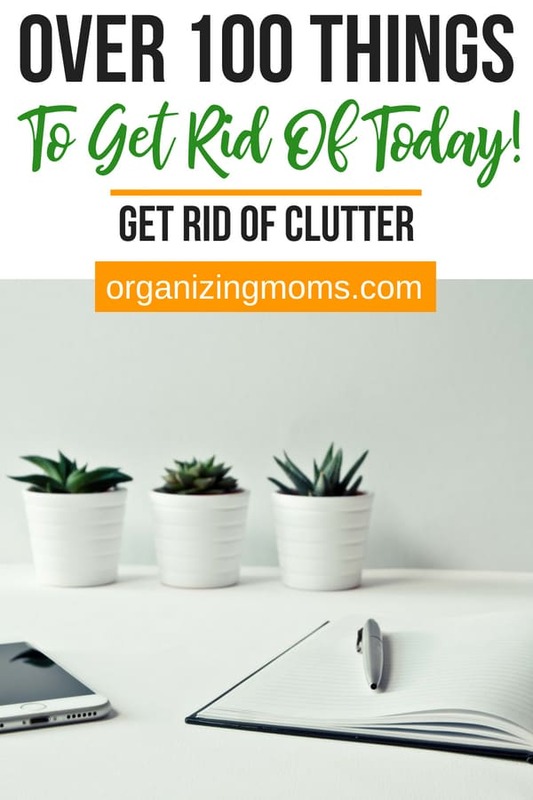 Ready to declutter? A lot of the clutter in our lives is stuff we’ve just gotten used to. It’s become so much a part of our environment, that we don’t even notice it anymore. A lot of the clutter we’ve been hanging onto is stuff we can throw away. Or recycle, give, donate, or repurpose (within reason – it’s not a good idea to hoard recyclables). Not sure how to dispose of your decluttered items? 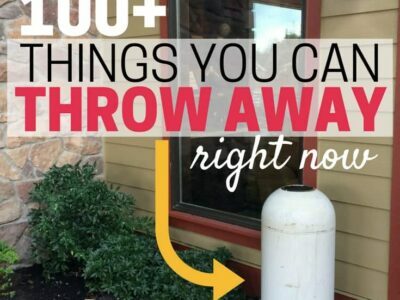 Here’s a guide to figuring out what to do with the stuff you get rid of. Receipts you no longer need. Dead or nearly dead plants. Plastic hangers that come with clothes from the store. Cords for cell phones you no longer own. Glasses you no longer use. Sunglasses you no longer use. Change (collect it in a jar and take it to a bank or Coinstar machine to exchange for bills or gift cards). Old rugs that are rolled up and taking up space in your basement or garage. Worn out bras and undergarments. Costume jewelry you don’t wear. CDs you don’t listen to. Cleaning products you don’t use. Extra rags you don’t use. Mops and brooms you don’t use. Plastic shopping bags (stores will sometimes take these back). Old margarine and yogurt tubs. Old sneakers (sometimes athletic shops will take these). Dusty candles you’re not going to use. Vases you got for free with a flower delivery. Crusty, dried up Dryel packets. Dried up hand warmers, foot warmers, etc. Broken or torn luggage that’s beyond repair. Small hand sanitizer bottles with just a little of product left inside that’s impossible to get out. Bumper stickers you don’t plan on using. Bumper stickers you are using that need to be taken off your car. Greeting cards with no sentimental value. Hotel or sample-sized toiletries – great for donating to shelters! Snacks that continually get passed over. Old cookware – especially the stuff that could be hazardous. Mechanical pencils that are stuck or always get stuck. Old shirts with armpit stains. Labels and address stamps for your previous address. Broken or unused holiday decorations. Hand soap that smells revolting. Crinkled up or torn wrapping paper, tissue paper, gift bags. That grocery list you forgot to take to the store. Cell phone covers for phones you no longer own. Forgotten cords from electronics of the past. Preferred shopping cards from stores you never shop at. If your store lets you input your phone number instead of showing your card, you can also get rid of your plastic one. Keychains from the past that you don’t use. Especially the ones you got for free. Keys from old apartments, houses, storage lockers, etc. Textbooks that are never referenced. Yes, they would make great doorstops, but it’s time to let them go. Extra buttons (usually packaged in their own little plastic baggie!) for new clothes you bought. Expired medications – take to a medicine take-back event. Super-old or nasty cough drops. Boxes of tissue with only 3 or 4 tissues left. Consolidate the leftovers into one box and get rid of the extra tissue boxes. Syringes and cups that come with children’s medicines. Keep what you need in case of a family sickness, and get rid of the rest. Bandages in packages that look like they might start decomposing right before your eyes. 3-D crafts made of sourdough that are cracking and falling apart, despite their cuteness. Games with lots of missing pieces. Stuff you’ve been keeping from your past career. Keep your certifications. The rest is probably outdated anyway. Items in your pantry that you really don’t want to eat. Donate it before it expires. Someone out there needs it. Organizing gadgets that didn’t work for you. Maybe they’ll work for someone else? Old paint. 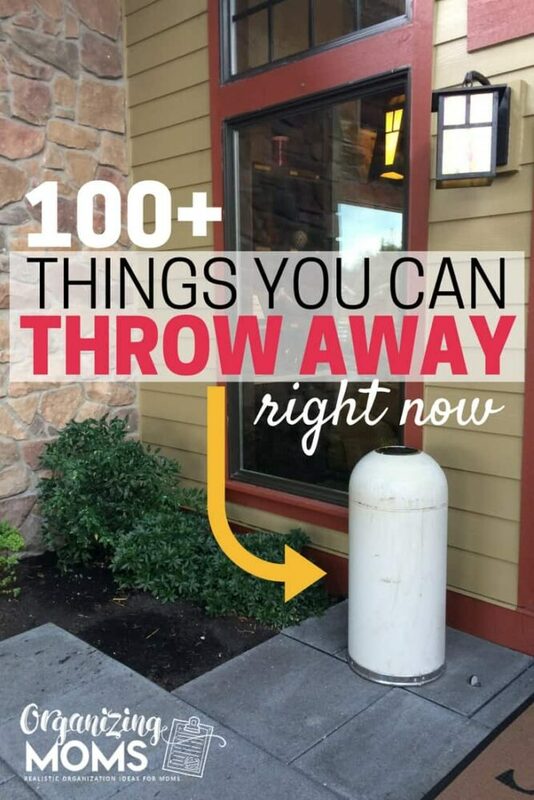 Call your local waste disposal company and find out how to get rid of it safely. Boxes for things you bought – toys, phones, computers, etc. Plastic cutlery – bring it to work. Plastic containers you don’t use. Loose screws, nails, nuts, bolts. Pet toys your pets don’t use. Snacks for your pets that they don’t like. Extra lanyards, name tag holders, etc. Gift cards – use them up! I try to load my Amazon gift cards onto my account as soon as I get them. Excess packaging supplies – bubble wrap, old mailers, the plastic puff things that come in delivery boxes. Old sunscreen. Apparently sunscreen loses its potency after a year. I learned this the hard way. Plastic bags from the dry cleaner. Never opened goodie bags from birthday parties – I wish this goodie bag trend would go away! Almost empty bottles for bubbles. Consolidate them into one bottle and get rid of the rest. Broken bubble blowing gadgets. Save the batteries if they’re still good. Perfume or cologne you don’t use or like. Broken lawn furniture unsuccessfully mended with duct tape. Toys your pets chewed up. Old plastic baby bottles that probably have BPA. Old water bottles that probably have BPA. Souvenir beer steins and shot glasses. Keep if you’re still active in your fraternity. T-shirts, and sweatshirts from college and high school. If donated, a youngster might appreciate their “vintage” quality. Headbands, scrunchies, barrettes, banana clips, and other hair accessories you’ve grown out of. Best friends necklace for friends you no longer keep in contact with. These things only created problems, no? Remotes to devices you no longer own. Old tape players, 8-track players. Things you’ve been saving for projects that never happened…toilet paper rolls, Altoids tins, wine corks, etc. Need more decluttering guidance? Get Rid of It! 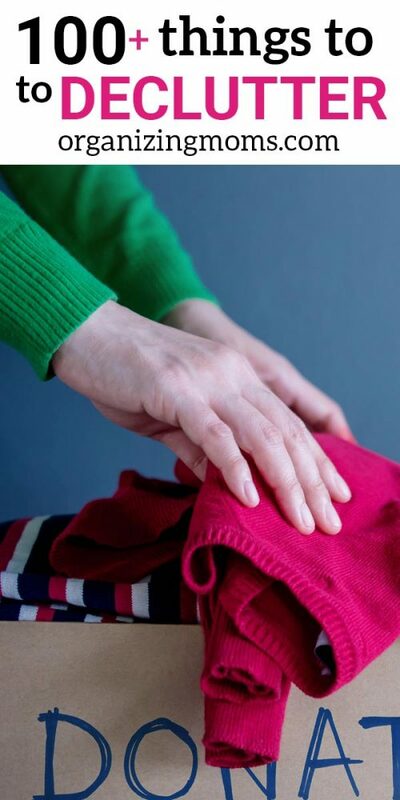 A Step-by-Step Decluttering Guide for Beginners has easy to manage daily tasks to help you get rid of the stuff that’s easiest to declutter. 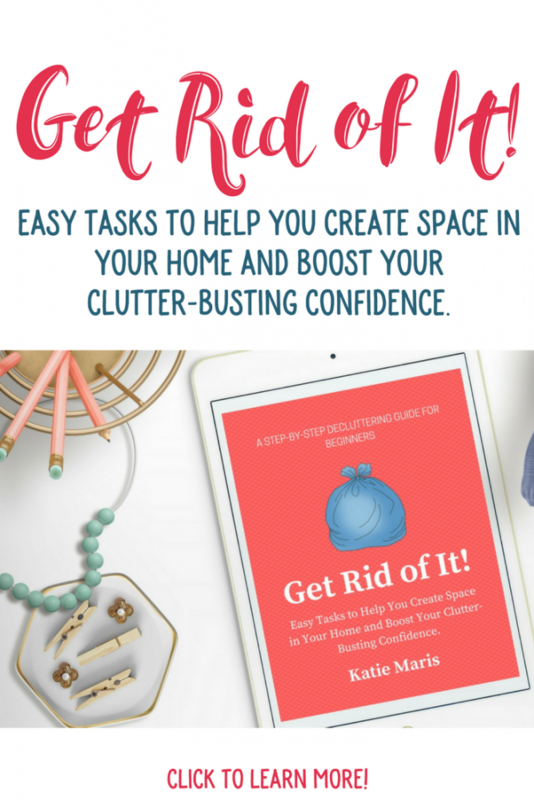 By working through the guide day-by-day, you’ll build your clutter-busting confidence and be able to take on all of the clutter in your home. Click here to get your copy today! Get this post in checklist form! Download a printable checklist of all of the items you can declutter right now! The checklist is yours for free when you subscribe to the Organizing Moms email newsletter!